"Whether it's Peppa Pig on children's TV or a Disney movie, ... they are carefully produced and monitored so that kids are essentially safe watching them, and can be trusted as such. This no longer applies when brand and content are disassociated by the platform, and so known and trusted content provides a seamless gateway to unverified and potentially harmful content. "YouTube and Google are complicit in that system. The architecture they have built to extract the maximum revenue from online video is being hacked by persons unknown to abuse children, perhaps not even deliberately, but at a massive scale. I believe they have an absolute responsibility to deal with this, just as they have a responsibility to deal with the radicalisation of (mostly) young (mostly) men via extremist videos — of any political persuasion. They have so far showed absolutely no inclination to do this, which is in itself despicable. However, a huge part of my troubled response to this issue is that I have no idea how they can respond without shutting down the service itself, and most systems which resemble it. We have built a world which operates at scale, where human oversight is simply impossible." How to insulate yourself from the perceptions of others? "the Republican leaders' obsequiousness to Trump after they'd passed the tax bill ...Paul Ryan: "Something this big, something this generational, something this profound could not have been done without exquisite presidential leadership.” Mitch McConnell: "Mr. President … this has been a year of extraordinary accomplishment for the Trump administration." This despite Trump having insulted them on Twitter ("Our very weak and ineffective leader, Paul Ryan." "Can you believe that Mitch McConnell, who has screamed Repeal & Replace for 7 years, couldn't get it done.”) … I wondered how these leaders, public and important men, could fawn like this. Don't they know what they look like? Don't they know how others see them? My sociological spider sense tells me to think about them the way we think about any small-group culture. American sociology, since its early days, has shown how groups develop a set of ideas about what they do, especially when what they do is seen by others as strange or wrong. Howie Becker's essays on marijuana-using musicians in the 1940s may be the best known example. … [T]he question implicit in Becker's Outsiders and all those other studies of deviance in groups: How do you insulate yourself from the perceptions of others?" 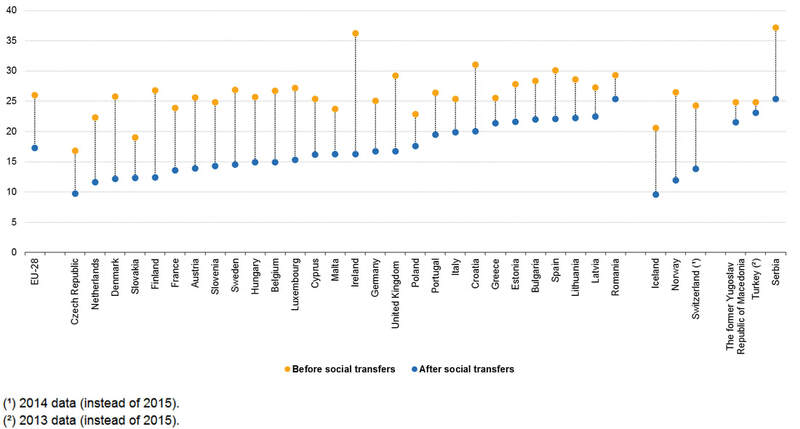 "A broad ‘at-risk-of-poverty or social exclusion rate’ indicator was proposed by the European Commission ... This indicator is an aggregate of three sub-indicators: monetary poverty, severe material deprivation and very low work intensity (the latter is limited to people aged 0 to 59). … People are counted only once in the headline indicator, even if they fall into more than one category. 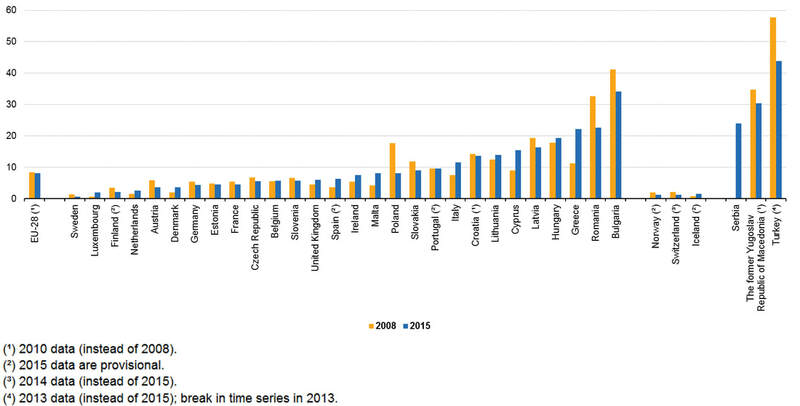 Monetary poverty has been increasing gradually since 2005. The number of people aged 0 to 59 living in households with very low work intensity declined between 2006 and 2008, but has since returned to the previous levels. The monetary poverty threshold is set at 60% of the median disposable income. That means that if the median income increases, but the inequality of the income distribution remains unchanged or even increases, the number of people below the poverty line does not decrease. Absolute poverty measures reflecting a person’s ability to afford basic goods, however, are likely to decrease during economic revivals when people are generally more financially better off. 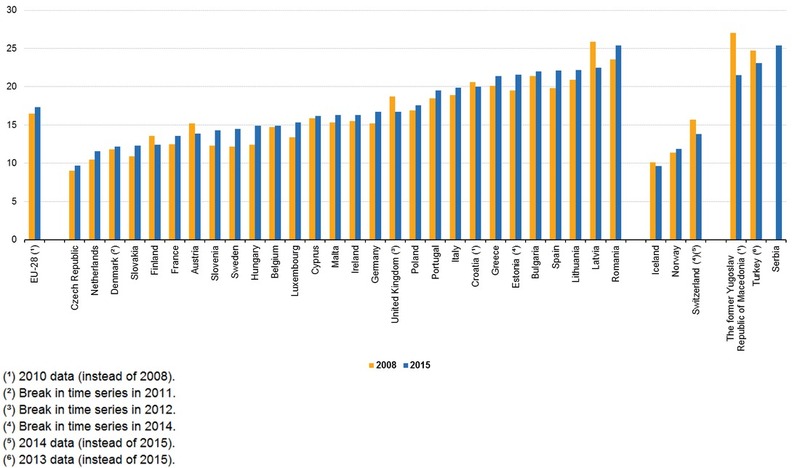 Rural vs urban: The countries with the highest poverty rates in rural areas compared with urban areas are Romania and Bulgaria (26.7 and 23.1 pp higher). 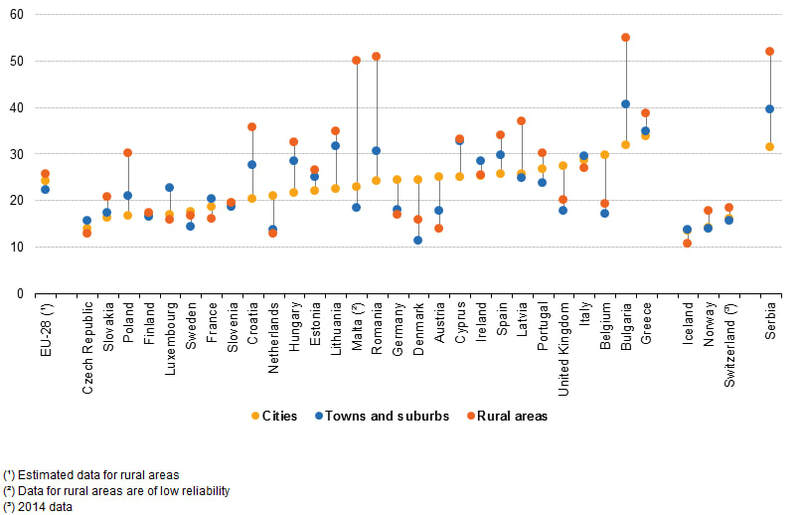 In other countries, such as Denmark, Austria, Belgium, the United Kingdom, the Netherlands and Germany, the opposite is true: a clearly larger share of urban residents live in poverty or social exclusion compared with residents in rural areas or towns." "1) Labor union power is weaker just about everywhere. 2) The extent of labor union power varies considerably across countries, many of which have roughly similar income levels. This pattern suggests that existence of unions, one way or another, may be less important for economic outcomes than the way in which those unions function. The chapter notes the importance of "peaceful and cooperative industrial relations," which can emerge--or not--from varying patterns of unionization." Those peaceful and cooperative industrial relations are a big reason for Germany’s relative success in recent years. Relations were good, and so firms were able to ask for concessions from labor without too much backlash. The unemployment rate stayed low, so it's possible that in some dimensions this works quite well. 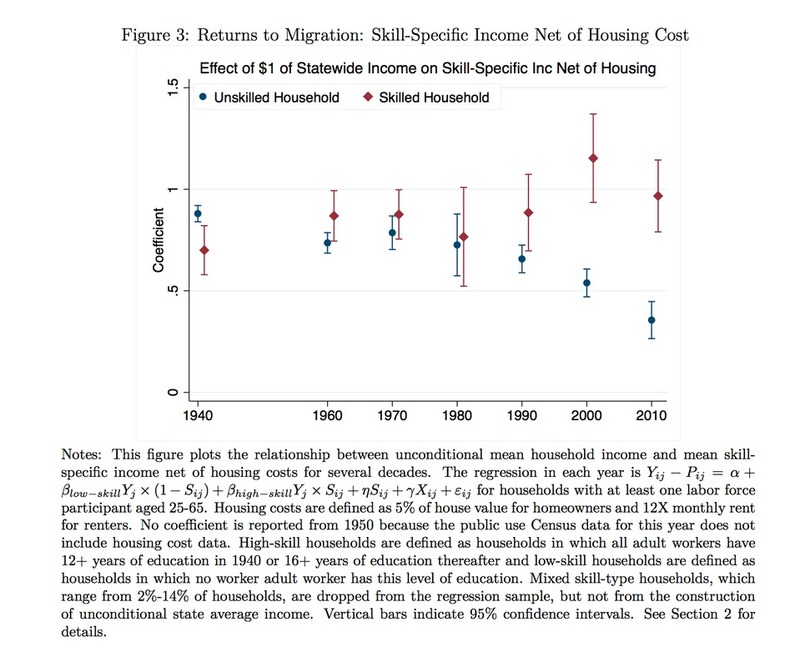 But it makes sense to think of those relations as a form of capital, or as a reservoir of goodwill: something that can be spent to achieve your ends (e.g., lowering labor costs), but not indefinitely. At some point, your reservoir's depleted, the capital spent, and your left with disgruntled workers who don’t trust "the powers that be." Germany's distinctive in that there’s both a cultural trope that saving/austerity/belt tightening is really crucial, and there’s enough social cohesion for people to believe everyone is tightening their belt and accepting pay cuts. That is, the cuts aren’t perceived as unfair. In the long run, though, cooperative industrial relations are fragile; they are particularly hard to maintain when workers accept pay cuts. All it takes is for another group to do ok (e.g., immigrants / refugees, or the corporation / managers) for the setup to be perceived as unfair. "Pluralism is the direct opposite of the dualist perspective of both populism and elitism, instead holding that society is divided into a broad variety of partly overlapping social groups with different ideas and interests. Within pluralism diversity is seen as a strength rather than a weakness. Pluralists believe that a society should have many centers of power and that politics, through compromise and consensus, should reflect the interests and values of as many different groups as possible. Thus, the main idea is that power is supposed to be distributed throughout society in order to avoid specific groups— be they men; ethnic communities; economic, intellectual, military or political cadres, etc.— acquiring the capacity to impose their will upon the others." (kl 733-738). And on other social issues, young Republicans are more conservative than older Republicans. … abortion … gun control ... The overall patterns do not suggest a massive Democratic or liberal surge among the young, or a significant number of liberal young Republicans on the cusp of leaving or changing the party." Jeffrey Williams, from 1998: A “more accurate narrative of globalization experience in the decades prior to the World War I would read like this: A spreading technology revolution and a transportation breakthrough led first to a divergence of real wages and living standards between countries; the evolution of well-functioning global markets in goods and labor eventually brought about a convergence between nations; this factor price convergence, however, planted seeds for its own destruction because it created rising inequality in labor-scarce economies [the US] and falling inequality in labor-abundant economies [Italy, Sweden]. The voices of powerful interest groups who were hit hard by these globalization events were heard, generating a political backlash against immigration and trade. A late-19th-century globalization backlash made a powerful contribution to interwar de-globalization. … history does supply a warning: a backlash against globalization can be found in our past, so it might reappear in our future." Good paragraph from Citylab: "Perhaps the central problem of housing affordability is one of scale: the number of units that we're able to provide is too small. That's true whether we're talking about Section 8 vouchers (that go to only about 1 in 5 eligible households), or through inclusionary zoning requirements (which provide only handfuls of units in most cities). The very high per-unit construction costs of affordable housing only make the problem more vexing: the pressure to make any project that gets constructed as distinctive, amenity-rich and environmentally friendly as possible, means that the limited number of public dollars end up building fewer units. And too few units—scale—is the real problem here." residential real estate and equities [i.e., risky assets] have shown very similar and high real total gains, on average about 7% per year. Housing outperformed equity before WW2. Since WW2, equities have outperformed housing on average, but only at the cost of much higher volatility and higher synchronicity with the business cycle... housing returns are similar to equity returns, yet considerably less volatile. …. They have a great summary of the secular stagnation hypothesis: "We are living longer and healthier lives and spending more time in retirement. The relative weight of borrowers and savers is changing and with it the possibility increases that the interest rate will fall by an insufficient amount to balance saving and investment at full employment.” The hypothesis is that the economy can fall into low investment traps. Their evidence is compatible with that view. Also: “Piketty (2014) argued that, if the return to capital exceeded the rate of economic growth, rentiers would accumulate wealth at a faster rate and thus worsen wealth inequality. Comparing returns to growth, or “r minus g” in Piketty’s notation, we uncover a striking finding. Even calculated from more granular asset price returns data, the same fact reported in Piketty (2014) holds true for more countries and more years, and more dramatically: namely r>>g... In peacetime, r has always been much greater than g."
Sentences in Bloomberg: “Even after the Great Recession, mobile capital continued to concentrate wealth in the hands of a transnational minority ... Much of the success of demagogues such as Trump lies in this minority's ability to redirect public anger onto trade and immigration, while dodging blame for the consequences of financialization."